“From God To Me” from Christian Faith Publishing author Sonia Beckwith is a guide to a better understanding of the bible and a better relationship with God as explained by someone relatable. “From God To Me”: is an instruction manual for people on how to become closer to God. “From God To Me” is the creation of published author, Sonis Beckwith, a mother of three, grandmother of eleven, and has followed God for many years. Beckwith currently works as a hairstylist. Published by Christian Faith Publishing, Sonia Beckwith’s new book gives readers an insight on how to forge a closer bond with God as explained by a who has worked hard on their relationship the Lord. Beckwith wrote this as a means for the regular person to have a helping hand in their spiritual journey. Taking a conversational tone, Beckwith approaches readers with a familiar voice to help them embark on a quest for a better spiritual connection. This voice helps relate the messages the author imparts in a more relatable fashion. 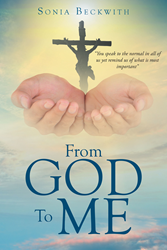 View a synopsis of “From God To Me” on YouTube. Consumers can purchase “From God To Me” at traditional brick & mortar bookstores, or online at Amazon.com, Apple iTunes store, Kobo or Barnes and Noble. For additional information or inquiries about “From God To Me”, contact the Christian Faith Publishing media department at 866-554-0919.